Little Red Ridding Hood and Santa Claus on Mississippi associates three eclectic ideas within a postmodern landscape. Traditionally enough, line and shade render the pictorial depth of the drawing. 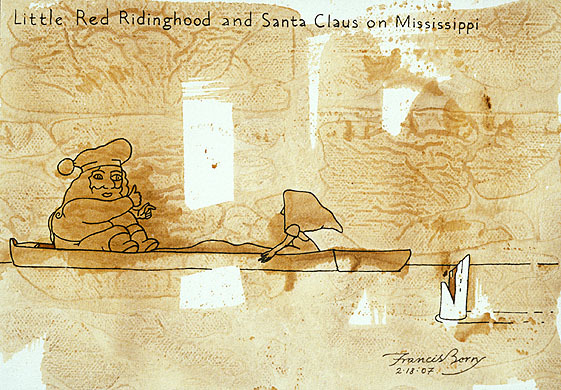 Yet the assemblage of disparate thoughts evoked by "Little Red Ridding Hood" beside "Santa Claus" on "Mississippi" adds its convivial interest, conceptual depth, and irony to the scene. Linking as it does two popular icons to a proverbial river, both of the landscape's visual and mental dimensions project into postmodern space-time.